is a girl-about-town and general, adventurous, know-it-all. 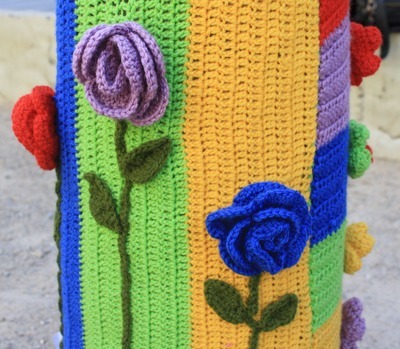 If you've spent any time in the city lately, you may have noticed that a number of towering, eucalyptus trees on Swanston Street have been covered with colourful knitting and crochet. 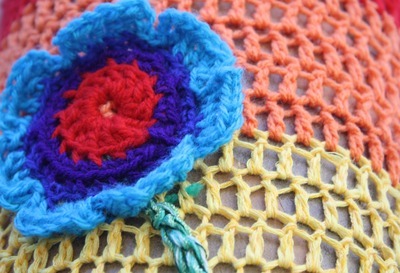 Called 'yarn bombing', it's a form of street art that's been getting a little bit of media attention of late. The yarn bombers perform clandestine attack with wool, cottons and acrylic blends, and sometimes with sequins or sparkles sewn in. They create knitted panels at home and then sneak out during the night, quickly attaching and stitching their work onto trees, street signs and bicycle racks. Unlike some other forms of street art, most councils are in support of this nannyish graffiti. They've been celebrating yarn bombing as a colourful and vibrant craft, allowing, even encouraging, bombers in their suburbs, provided that none of the work damages underlying structures and can be easily removed if necessary. This month's yarn bomb on Swanston Street was a completely legal event, with the area inside City Square cordoned off and a cherry picker brought in so the knitters could scale the heights of the tall trees. On the day of installation, the group also ran knitting workshops for curious passers-by. Each knitting panel in City Square has a small laminated label attached so you can see which individual was responsible for the style and stitches, although the rogue yarn artists often go by their street name only so you might not learn much about their real identity. If you're interested in yarn bombing, the group responsible for the tree coverings have a Facebook page dedicated to their craft. You can investigate Twilight Taggers or Yarn Corner for more information. 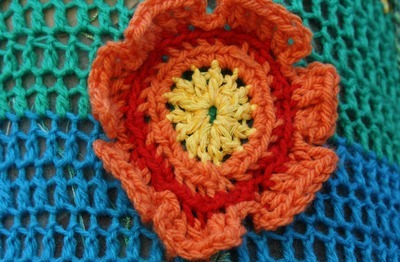 The yarn bomb in the City Square will be on display until Sunday, February 19th, 2012. It's completely free to view.